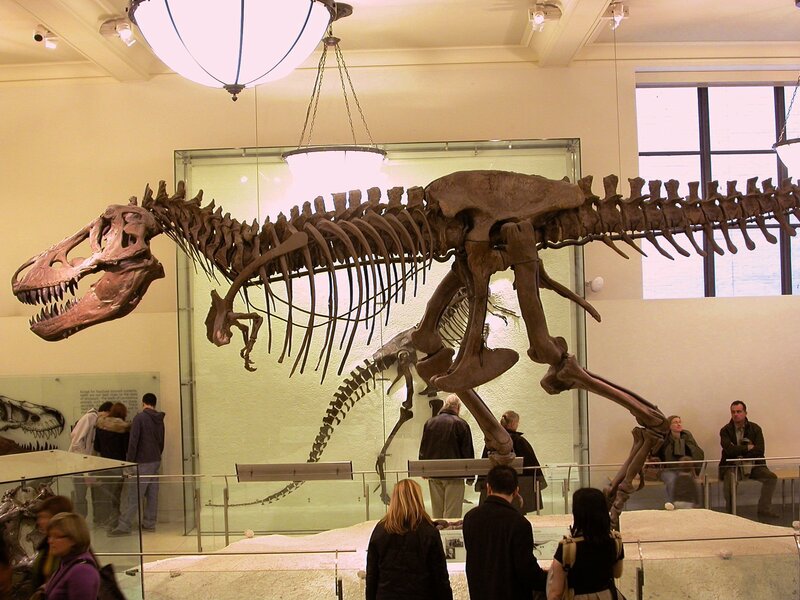 The Top 5 Things to Look for in a Used T. rex: You Tell Us! AMNH T. rex mount, photo by Mike Taylor. If I want to be a truly educated observer of Tyrannosaurus rex mounts, what 5 things should I look for in a reconstruction to assess if it is true to our current scientific understanding? I’m not talking tail dragging/upright at this point…we are well past that I hope. If he had asked about Apatosaurus, I could have written him a novel. But it is a point of pride with me not to contribute to the over-application of human attention to T. rex; not only would it be vulgar, it would also be a waste of resources, considering how many people already have that covered. So, you theropod workers and avocational “rexperts”, we’re finally inviting you to the high table. Please, tell us–and Doug–what separates the good T. rex mounts from the crappy ones. Big piles of SV-POW! bucks will be showered on whoever brings the most enlightenment, especially if you adhere to the requested List of 5 Things format. The comment lines are open–go! Even I find T rex boring. No, not boring, over rated. Since you brought it up, why limit the discussion to T. rex? What would you look for in an Apatosaurus? Well, my three would be hands correctly positioned, palms in. Teeth firmly inserted into their sockets, not hanging out. And that the ribs are mounted correctly, swept back and all that. I would look to see if it has real rex feet (with a slender arctometatarsalian metatarsus). If its an AMNH knock-off it will have chunky made-up feet that are not accurate. I would look to see if the rib cage should be narrow enough to let the two coracoids almost touch in the middle. If you want the skeleton to be absolutely complete there should be a gastral basket and a tiny metacarpal III (but no digit 3). And yes the palms should face inwards. You could almost say this about any extinct taxon. For example, one of the species I study, who is fairly well-known in paleontological circles despite being a stinkin’ mammal, has had all of one correct reconstruction in the 70+ years since it has been discovered. One. 1. Scarring on the skull, particularly the top of the snout, bottom of the mandible, and back of the skull. Surprisingly common on larger specimens, say above 7 metres. The previous owners have presumably gotten into scuffles of some sort which resulted in the damage. 2. They say “[D]on’t look a gift horse in the mouth” but tyrannosaurs are not that closely related to equids, so we can safely ignore that advice. Examine the mouth to determine whether the specimen is long in the tooth. Unlike with equids, this will be due to the teeth not being fully inserted into the sockets, rather than being exposed by receding gums. Check for missing teeth too – some previous owners are known to have been fairly cavalier with regard to dental maintenance. 3. Check for the presence of gastralia and their general condition. These are fairly easily damaged but it’s still surprising how many specimens are missing them completely. They vary in number but any less than 15 pairs should be treated with suspicion. 4. Tail vertebrae. It’s almost impossible to find a complete series without any damage at all. In most cases the damage will be readily apparent and, if minor and restricted to no more than 3 or 4 verts, should be of no concern. Unfortunately, this area is ripe for after-market substitutions and outright fakes. Often these will be fairly obvious due to differences in colour and texture from the genuine parts, but sometimes a closer investigation may be required. A simple hardness test will usually suffice – see if you can scratch it with a pocket-knife. 5. Lastly, provenance. Occasionally, attempts are made to pass off similar models as genuine T. rexes. The specimen most commonly misrepresented is the closely-related T. bataar. These are from Mongolia and are most likely illegal imports. Best to avoid. 2) Are the feet reconstructed correctly (as Adam pointed out). AMNH mount fails here again. Should have long (for their size), slender (for their size) arctometatarsi, NOT allosauroid feet. 3) Are the premaxillae restored correctly? MOR 555–source of many casts for T. rex at museums worldwide–did not have premaxillae and for reasons known by to Jack they restored it with basal theropod-style anteroposteriorly extended premaxillae, and not the elegant mediolaterally-only snub snout of tyrannosaurids. 4) Tail length (as Mark Robinson points out). Many mounts have too many. 5) Torso shape. It helps if they include the gastralia in there, to help round out (literally!) the body shape. Bonus if they remember the furcula (and use an actual furcula for it: Sue, I’m looking at you!!). Biggest thing to me (and I noticed this when I was looking at a tyrannosaur that was for sale in Tucson) is make sure the bones are in anatomically reasonable positions. The skull on this mount was impressive; leaning forward while near the ground – perfect for roaring in the face of visitors/potential buyers. Unfortunately it was also internally decapitated. The skull was completely disconnected from the vertebral column. It was well hidden but the neck and skull were not articulated. The acetabulum was likewise malformed – the pubis and the ischium were so far apart ventrally that the femoral head could have passed between them. This was true on both sides. Another thing I noticed was that the amount of reconstruction, while clearly indicated on the sign, was not as obvious to the lay person on the mount. I didn’t like that – it implied that the whole thing was real bone, and I’d imagine that if this thing ever ends up at a museum it will be a PITA for curation. 1. Forelimbs sticking to their actual range of movement: palms facing medially, antebrachia not pronated. Whole arm not strangely folded together or reaching too far forwards (or back). 5. metatarsals tightly articulated and gracile, not broad and loose. Some other things would be nice that are not usually done. The whole array of ventral thoracic bones is often missing, due to logistic problems. The teeth are often slipped out of their sockets, making them seem too long.